Product #15718 | SKU P-UMOUNT360 | 0.0 (no ratings yet) Thanks for your rating! The UltraMount 360 is the ball and socket head portion of the UltraClamp 360. The UltraMount 360 allows you to take the flexibility of the mount and apply it to your existing tripod or walking staff. It fits on any device featuring a 1/4–20 screw, and lets you position your camera, spotting scope, camcorder, or remote flash at the desired angle. With one simple adjustment knob for quick and accurate multi-directional control you're able to ratchet and pan smoothly for faster repositioning and better action shots. 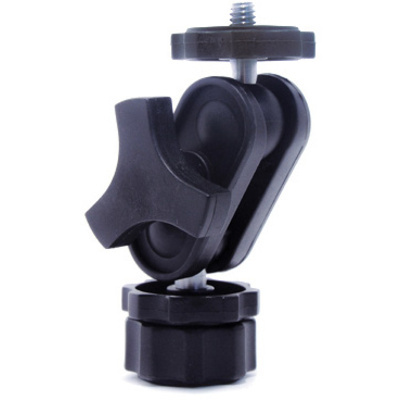 Attaches to any device with a 1/4–20 mounting screw or female thread, such as XShots™, monopods, tripods, and easily converts it into ballmount for increased adjustability. Fits any camera, camcorder, binocular, or other device with a 1/4–20 female thread.